Every Friday, the Hackaday.io community gathers ’round the fireplace and discusses the challenges facing the world. This is the Hack Chat, and in previous incarnations, we’ve talked about custom silicon, Arduinos, PCB fabrication, old technologies, and hardware manufacturing. For this week’s Hack Chat, we’re opening up a design challenge. We’re asking the community for help on developing a wireless position sensor. This is a Design Slam Hack Chat, and we’re looking for contributors. 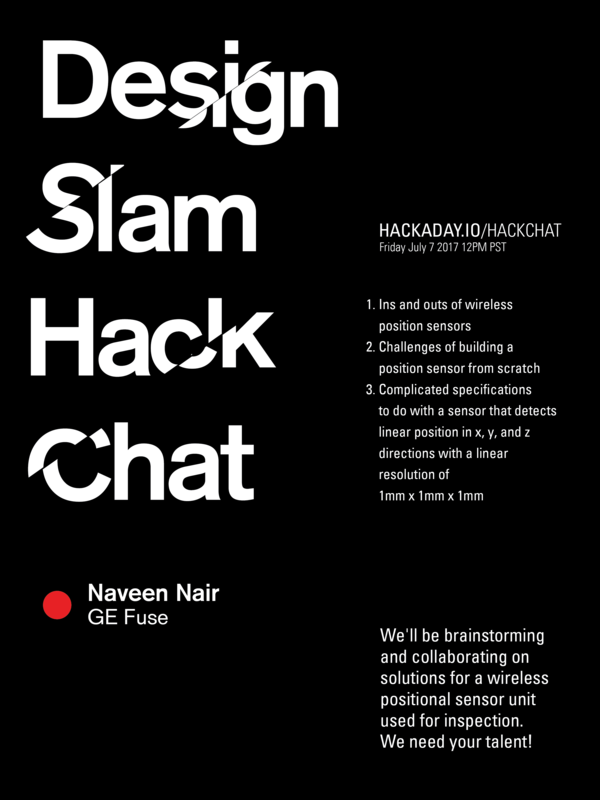 Our guest for this week’s Hack Chat will be [Naveen Nair], technology leader for GE Fuse. We’ll be discussing position sensors during this Hack Chat. If you’ve ever used a mouse, you’re using a position sensor, but for this Hack Chat we’re designing something a little more challenging. The Fuse group is attempting to build a low-cost, wireless position sensor with hand-held ultrasonic inspection units. Why is GE interested in this technology? Our guess is inspecting jet turbines, or something like that. That doesn’t mean low-cost wireless position sensors wouldn’t have other applications, though. Just imagine what a quadcopter could do if it could sense its position with 1mm resolution. Won’t be able to make the Hack Chat? Don’t worry, we’ll be putting a transcript up here sometime after the event. Our Hack Chats are live community events on the Hackaday.io Hack Chat group messaging. This Hack Chat will take place at noon Pacific time on Friday, July 7th. Confused about where and when ‘noon’ is? Here’s a time and date converter! I’m not really sure what the expectations are here. Position sensing has always been a very heavily researched field, and is receiving even more attention now that VR is in the spotlight. Hobbyists are not going to come up with new solutions. Maybe a hobbyist will discover magic? Big boys certainly haven’t. Would this really be a “Design Slam” or would it be a lean 5S Kaizan event DMAIC one-piece flow. Could Bokode finally come into its own? That would be cool! Hover flys do it with a neural network smaller that the fullstop at the end of this sentence.